Our efficient and lightweight burners have been developed for use in living vehicles, caravans, boats and yurts, where an attractive heat source is required to keep going all night in total safety. The revolutionary vent system allows for instant control of the air intake, which combined with the airtight door and dual airflow, permits the logs to be burnt with remarkable efficiency. 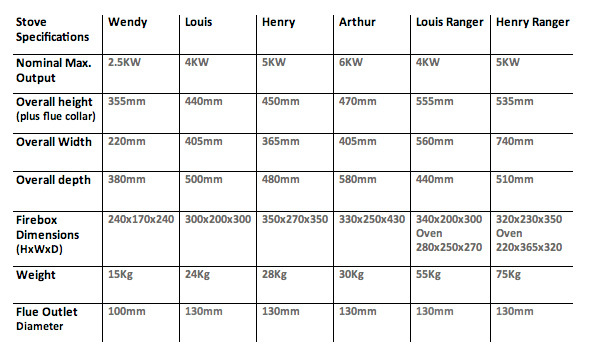 All the burners are suitable for cooking on the top plate, and for Oven Cooking there is a choice of two Ranges, based on the Henry and Louis models. There is a 6000btu Back Boiler option available on the larger models, this is ideal for heating a radiator or a small hot water cylinder. Your Windysmithy Woodburner will function equally well in a workshop or mobile home, and improvements and new models are added every year. Please note that our stoves are NOT as yet CE marked, and as such we cannot supply any stove for use in a house, for the time being. We are working on EN conformity, watch this space! Non Building regs environments do not appear to need CE approval for heating appliances.